Is AMC Finally Embracing Diversity This Fall? It's hard to believe it's already been a week since Comic-Con started, but here we are in that post-Con daze, and I'm still recovering. While I might need some more time before getting back into regularly scheduled posting, I didn't want to leave before I comment on a couple of the trailers that came out of SDCC. No, not this one or that one. Instead, I want to focus on the early looks that came out of the AMC presentations and how the network is kicking off the post-Don Draper era by seemingly embracing diversity in the casts of its newest shows. As a network, AMC was at the forefront of the Golden Age of Difficult Men. From Mad Men to Breaking Bad and The Walking Dead, the protagonists on AMC's shows were usually anti-heroes who traverse in the grey area between right and wrong and make the hard decisions despite the consequences. So it's because of characters like Don Draper, Walter White, and Rick Grimes -- along with Tony Soprano on HBO -- that television drama about bad men became the prestige format for cable. The other thing they all have in common? They're all white men. 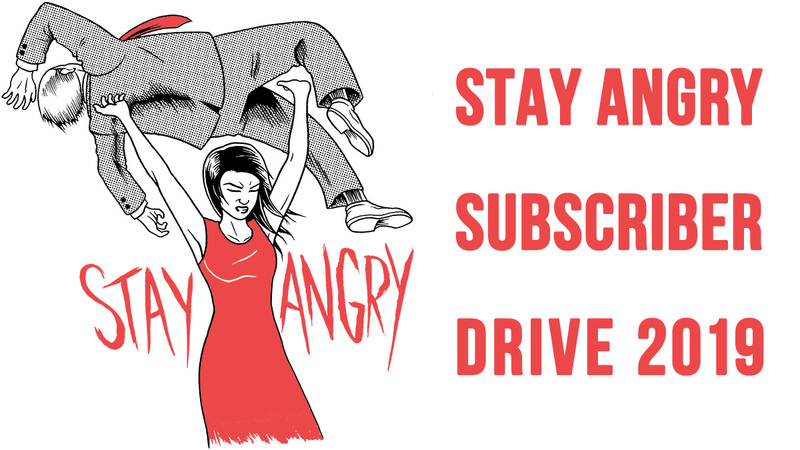 In 2015, though, that's going to change. AMC trotted out a few shows at Comic-Con -- as well as additions to current ones -- that might upend the number of white male characters on the network. In addition to having one of the more elaborate booths on the exhibit floor, where con-goers could pose for selfies with real-life zombies(! 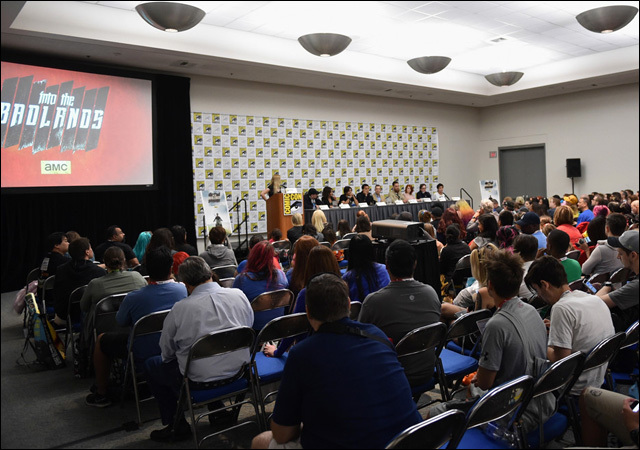 ), AMC filled Hall H on Friday with a two-hour Walking Dead panel that covered both the current series as well as the hotly anticipated prequel Fear the Walking Dead. Taking center stage at Hall H, the cast of the original Walking Dead joined Talking Dead host/moderator Chris Hardwick to tease new zombies, new cast members, and new villains. They also premiered a special four-minute sizzle reel -- featuring first look footage from season six -- that seems to position Morgan, as played by Lennie James, as the major antagonist to Rick and his crew. Better yet, the trailer is cut in a way to suggest that Morgan could potentially be the show's real hero, as Rick continues his descent into madness. 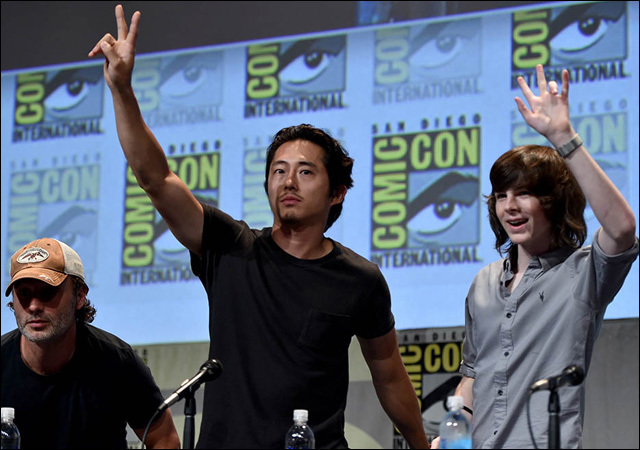 Though trailers can be misleading, the one shown at Comic-Con seems to imply divisions among the survivors as lines are seemingly drawn between Glenn, Darryl, Carol, and Rick. Later, Hardwick was joined on stage by the cast and crew of Fear the Walking Dead for another rousing hour of Q&A and teases for the series to come. I must admit, when I first heard about a TWD spinoff, I was skeptical. As big a show as Walking Dead is, hadn't they kind of exhausted all of the narrative possibilities for life in the zombie apocalypse? Turns out, no, they haven't. There are two things to glean from that trailer that definitely set the spinoff apart from the original. Because it's set in Los Angeles, rather than the rural outskirts of Atlanta, Fear will have set pieces and locations that will be visually different -- like beaches and urban areas. More than that, I love that the series will be set during the outbreak. That's one of the things the original TWD has never really shown apart from a few first season flashbacks. The other thing that stands out immediately is how diverse the cast is. 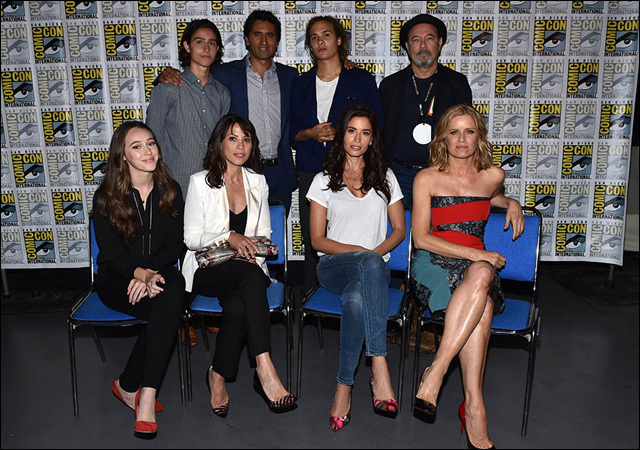 Not to take away from the diversity of the original cast -- despite its Black man problem -- but it seems that FTWD will center around a protagonist who is a person of color: Maori actor Cliff Curtis plays school teacher Travis Manawa. Also in the main cast are actors Rubén Blades, Elizabeth Rodriguez, and Mercedes Mason. Recurring cast members -- who weren't at San Diego -- also include Sandrine Holt and Colman Domingo. Whereas early season Walking Dead was mostly white people with a sprinkle of POCs, the cast of Fear is almost all people of color. Speaking of lead male characters of color, the other AMC show to have a major presence in San Diego was the, till now, mysterious martial arts epic Into the Badlands. Though the show was announced over a year ago, details of what it would be about were few and far between. Aside from a cryptic teaser and news that Hong Kong superstar (but American born) Daniel Wu was attached, the series from Smallville creators Al Gough and Miles Millar was a question mark to everyone. At their panel, the cast and crew of Into the Badlands revealed that the show would be very loosely based on the classic Journey to the West while depicting a genre-bending mashup of sci-fi, fantasy, and the old west. 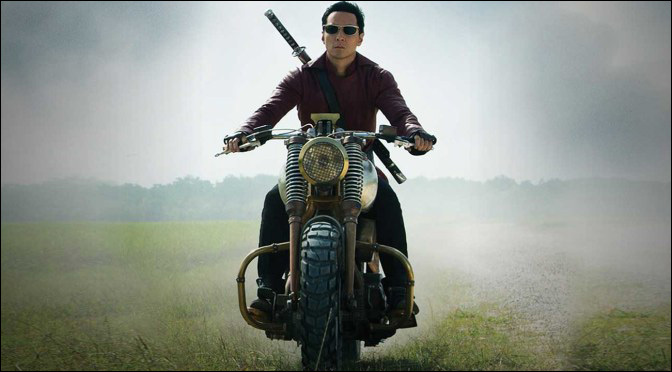 Was looking forward to Daniel Wu's forthcoming AMC series #IntoTheBadlands; after seeing the trailer I CANNOT WAIT. Martial arts enforcers in a weird future plantation economy...looks insane and amazing. 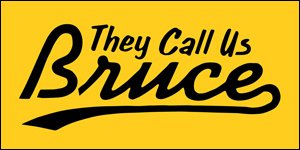 In addition to Wu as Sunny, the show will also feature actor Aramis Knight -- who is of Indian and Pakistani heritage -- as Sunny's young partner and sidekick. Yes, that's right. AMC will feature a genre show with two Asian American males in the lead. That's got to be a first, right? Not to be outdone by Comic-Con announcements, the day after the Con was over, another AMC series revealed that it would be telling a season-long story arc that is crucial in Asian American history. I had always been critical of the period series Hell on Wheels because it was a show about the building of the railroads that featured zero Chinese characters. If you know anything about history, you'd know how messed up that is. Well, it took them five seasons, but this fall, the show will finally depict the Chinese laborers who built the country. Featuring veteran actors Byron Mann and Tzi Ma, I might actually tune into the show this season, which coincidentally begins this Saturday. So thanks for embracing diversity, AMC. Now let's hope you don't kill off all of the POC characters before Christmas.